Without a doubt the bloodiest conflict in history was WWII. More people lost their lives during that conflict, through battle, genocide, starvation and disease than any other war. Over six long years, in a conflict that spanned the world, massive amounts of bombs were dropped, and some cities absolutely destroyed. Compare that conflict to later ones, such as Vietnam. That theater of war was a localized one compared to WWII, mainly centered on Vietnam. But it was a long war, lasting over a decade. So it may come as a surprise to learn about the bombs dropped on Vietnam compared to WW2. The war in Vietnam saw a massive amount of bombs dropped on the country compared to Europe in WW2. Laos and Vietnam experienced a bombardment the likes that has rarely been seen. Of all of the bombs dropped from the US aircraft it is believed that between 10 and 15 percent of bombs dropped on Vietnam didn’t exploded, while in Laos it is thought that around 30 percent never detonated. Even today, nearly 40 years after hostilities ended in the region, bombs that have not yet exploded are being discovered. Vietnam villagers are even making a precarious living from digging up and selling old bombs for about $2 a day. The final figures of bombs dropped on Vietnam compared to WW2. In WW2 there were about 2 million tons of bombs dropped. In Vietnam there were about 7 million tons dropped. To help understand how this could be possible we will explain a little more. A B-17 Flying Fortress (WWII) could carry 10 crew and 17 bombs. A B-52 Stratofortress (Vietnam War) held 6 crewmen and 108, 750 pound bombs, which is equal to about 6 B-17 Flying Fortresses. 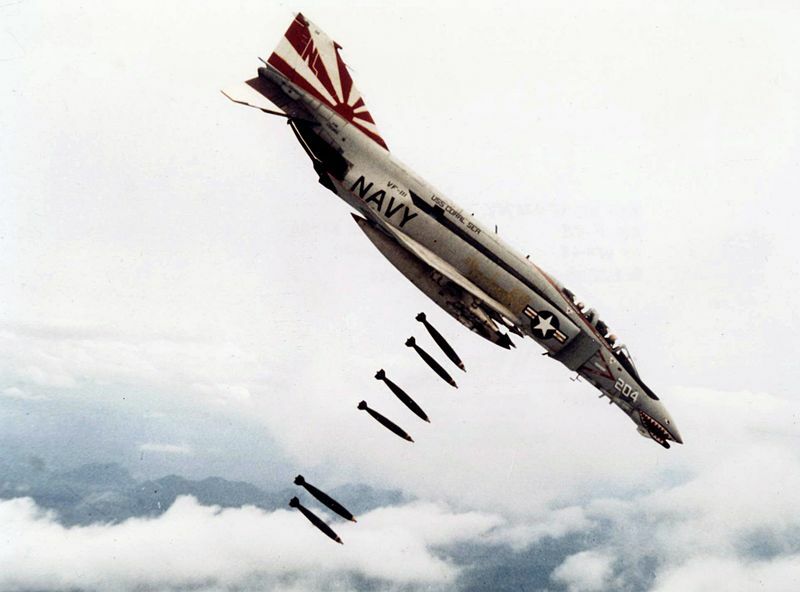 A F-4 Phantom jet which held 2 crew could carry as many bombs as the B-17.